We all have those people that are hard to buy for in our life. It might be family, a friend or a neighbor, who you just don’t know what to get them. I’ve put together this list of a few ideas I came up with to help you find something for those hard to buy for people on your own list. I hope you find a few new ideas. Just so you know some of the links below are my referral links. Which means when you purchase something through them I might make a little money at no extra cost to you. Thanks for your support in this way. You can read more on my disclosure policy. Give practical gift cards for places you know they shop. Places like the grocery store or if they have a smartphone an iTunes or Google Play gift card. You might need to investigate a little to make sure you pick a place they really shop. If you have someone who loves their coffee, that’s not me but I know a few people who love their coffee. Make a coffee basket. Get a cute coffee mug, fill it with chocolate covered coffee beans, you can pick them up in bulk at Winco Foods. Then tuck in a package of specialty coffee. That would make a perfect gift. Make your own pampering gifts with recipes like the honey lip balm, whipped body butter, vanilla coffee soap, lotion bars, or a sugar scrub. All of these recipes take only a few ingredients and a few minutes to make but are great pampering gifts to give. For a family gift, give a game the whole family will like to play and then invite them over for a fun game night with a few other families. Who knows it might become a regular thing for your families to do. This is also good for those families with food allergies, not food at all. Go to the Dollar Store and pick up a bunch of art supplies. Put them into a box and then give a card for the parents offering to babysit so they can have a night out. The whole family will be happy with that gift. For older kids, you might consider giving gifts like kits for the kids to build something. I know my son loved his Tin Can Robot kit we purchased for him and our daughter loves science kits. Who wouldn’t want the chance to win a few extra bucks? This time of year there is usually scratch-it tickets in the holiday theme. Give a few to a hard to purchase for person on your list, maybe they will hit the big one. Pick a special Christmas ornament for each member of the family. Try to find a special one that fits that person’s personality, hobby, or a favorite character they like. You can even make some yourself to give away. I know our pastor’s family collects nativity ornaments. One year we made a nativity ornament for their family as a gift. I know my kid’s great grandma has purchased ornaments for our kids and they always love it. The can look back over the years of all their very own ornaments. Do you have a favorite book that you know your family, friend, or neighbor might enjoy? Pick up a copy for them and give it as a gift. Books are always more special if you let the person receiving them know you enjoyed the book yourself and thought they might like it too. Pick up favorite books you enjoyed as a kid for those kids in your life that seemed to have every toy under the sun. I have yet to find a child who doesn’t like to sit and have a book read to them. Give your hard to purchase for person a chance to make a memory. Give them tickets to an event, a class, or even a spa day. 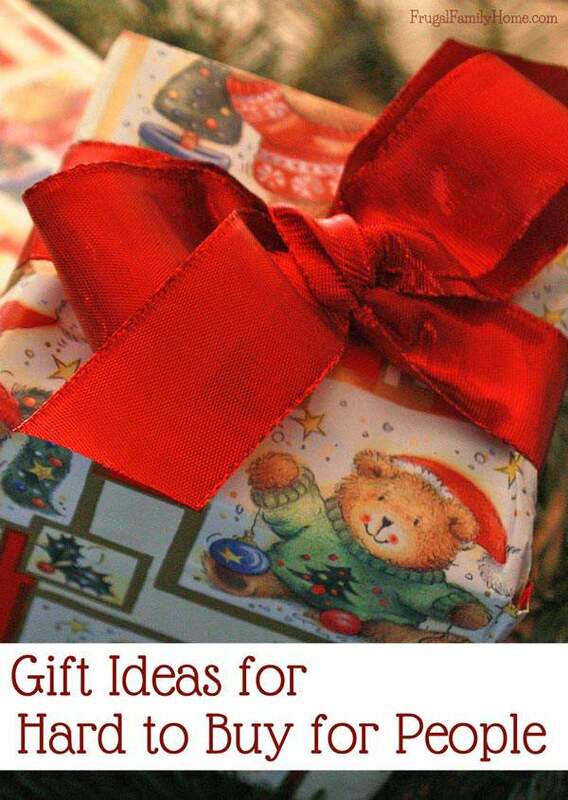 These type of gifts are clutter free and really fun for the recipient to use. If you are purchasing for a family maybe a family pass to a local theme park would be fun for them. Look around to see what your local town has to offer. Sometimes you just don’t know what to give someone but you can always offer your time and help. Let them know you would love to have them over for dinner or take them out to do something special. Offer to help an elderly neighbor with a project you know they just can’t do anymore, like clean the gutters or raking leaves. Small things like these can really be a true blessing more than anything you could ever buy. Plus you can get your own kids involved in helping too, to help teach them to be givers to those around them. 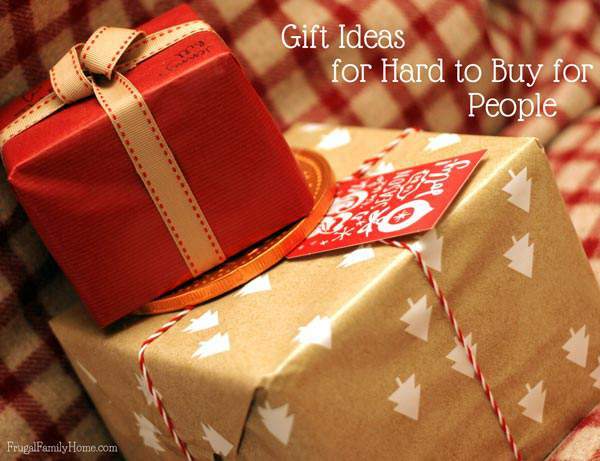 I hope some of these suggestions can help to make it a little easier to find a gift for those that are hard to buy for on your own Christmas list. Or maybe my suggestions above sparks an idea of your own. If you have an idea to add please scroll down and leave it in the comments below. I’m sure it will help another reader find the perfect gift for someone in their life. This is a great list of ideas! I know that our family would love to have a membership to the aquarium or the zoo instead of more cluttery toys or knick-knacks.